How can we get the best from our teams, staff, groups? By offering them the best possible structure and environment in which to think, plan and make their decisions. Most employers and leaders don’t have time to think about how cost-effective their meetings are, yet they are paying for people to be in the room. Just think about the metrics – are you getting value from your staff in meetings? How can you improve the experience and get more from everyone? By running your meetings as a Thinking Environment. This is a systematic and inspiring way of bringing groups of people together so they really listen to each other, build trust and better understanding, identify and then focus on the priorities and make purposeful decisions. How well are you creating this kind of environment already? This is facilitation of groups, teams and partnerships in ways that bring real understanding, creativity and connection into the room. This dynamic process reliably sets up meetings that matter enough to make a real difference to your results. How? 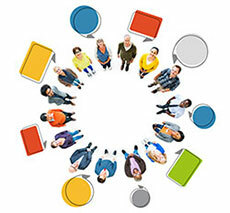 By acknowledging first that you want to change the established habits of your group or team, by working out what it is you do want to achieve, and then by setting up some very clear and sensible ground rules that help people to take turns, stick with the subject, listen without interruption and create a clear action plan before time runs out. How does that sound to you? For Testimonials and stories about the Thinking Environment way of working on local, national and international levels please visit the Testimonials page. Recent clients have included Imperial College, Dunnhumby, Midas Public Relations and the NHS/ CCG.